The last time I ran into Jeremy Camp was at Estes Park, Colorado back in 2004 or there about. I had the opportunity to speak with him on the phone recently in anticipation of his The Answer/All In Tour with Matthew West. Jeremy has been recording since 2000 when his first independent project, “Burden Me,” was released. “The Answer” is his 11th studio album. 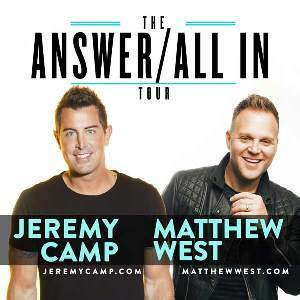 The Answer/All In Tour will take Jeremy and Matthew to 25 cities through November 2018. Then early in 2019 Jeremy will hit the road with tobyMac and the Hits Deep Tour. Jeremy and I talked about how Jeremy’s career has progressed, his kids, and what he thinks the future holds.